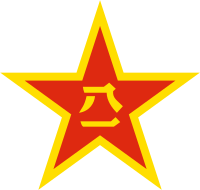 The People's Liberation Army (or simply PLA) is the armed forces of the Communist Party of China. The army was established (founded) on August 1, 1927. The People's Liberation Army is the largest military force in the world. It has about 2,250,000 personnel or employees (about 0.18% of the population of China). The PLA consists of five main branches: the PLA Ground Force, PLA Navy (PLAN), PLA Air Force (PLAAF), Second Artillery Corps (strategic missile force), and the PLA Reserve Force. Military service is compulsory (required) of for all men and women who reach the age of 18. This page was last changed on 9 April 2019, at 02:29.